About a year ago I wrote a series of columns about the copyright-dilemma. I wanted them to be published somewhere, so I carefully weighted my words and tried not to offend anybody, but still get to the point of the matter. If you understand Dutch, you can read these columns here. I soon realised that the copyright-dilemma cannot be discussed from my standpoint without making some other people very angry, so I stopped writing about this issue. But is on my mind every day. The video is made by Eric Faden. I want total freedom to do whatever I like. That means that other people should have that freedom too. I don’t do or leave things because of laws, and I don’t think most other people do that. Laws don’t prevent theft, abuse and violence, as we can all see every day in the news. I consider myself as one of the good guys. The idea that I am doing a criminal act when I copy a CD is too absurd to even think about. Still, this is the level where for some people the discussion should begin. And end! I have made almost all my artwork available in some form. Everybody is free to do with that whatever they want. Of course, I would like to be mentioned as the artist if my work is being used. But even if people do not do that, that is their choice. I think that such choices are dead end roads, and that it is matter of time before people find that out. Not a matter of laws, threats and repercussions. Here is Oh my god, that is a Funky . 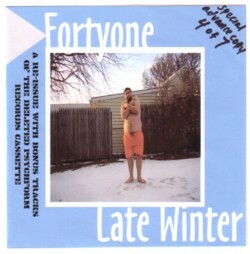 It is a track from FortyOne’s Late Winter tape, that FortyOne made, and that he turned into a CD recently.